Championship side Brighton & Hove Albion have upheld their decision to sack Gus Poyet for gross misconduct, following an appeal by the Uruguayan. 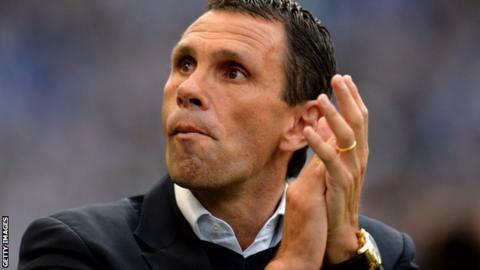 Poyet was suspended by the Seagulls in May and, following an internal investigation and disciplinary hearing, was sacked as manager last month. Three members of the club's board heard an appeal by the 45-year-old in London last week. Brighton named Spaniard Oscar Garcia as their new head coach last month. A statement on the club website said that in order "to ensure and maintain confidentiality and dignity throughout this process" no further details of the disciplinary or appeal hearings would be released at this time. The League Managers' Association said they would continue to support the former Tottenham and Chelsea midfielder should he decide to pursue the matter further. "We have every faith in Gus's integrity and have been impressed with the manner in which he has conducted himself during what, for him, has been an extremely difficult period," LMA chief executive Richard Bevan said. "We have supported Gus throughout the disciplinary process and will continue to do so as required. "We do not consider that the charges against him amounted to gross misconduct. Gus will now reflect on the outcome and discuss options with the legal team." Poyet was informed of his sacking by BBC Three production staff while working as a pundit on coverage of the Confederations Cup last month. At half-time in the Spain-Nigeria match on Sunday, 23 June Poyet said he had "had no communication from the club" but the Seagulls clarified their position the next day, saying the former Chelsea and Spurs midfielder "was aware his dismissal was pending" before he appeared on live television. Poyet was suspended following the Championship play-off semi-final defeat to Crystal Palace along with assistant Mauricio Taricco and first-team coach Charlie Oatway, pending an investigation into alleged breaches of contract. Both Taricco and Oatway have since departed the Amex Stadium by mutual consent. Poyet was appointed as Brighton manager in November 2009 and went on to lead the club to the League One title in his first full season in charge. Brighton finished fourth in the Championship last season, their highest league position in 30 years. "Despite the extremely disappointing end to Mr Poyet's career with Brighton & Hove Albion, the club would like to acknowledge Mr Poyet's service to the club," the club statement said.